On January 24, peace talks aimed at ending the conflict in the Central African Republic (CAR) opened in Khartoum. 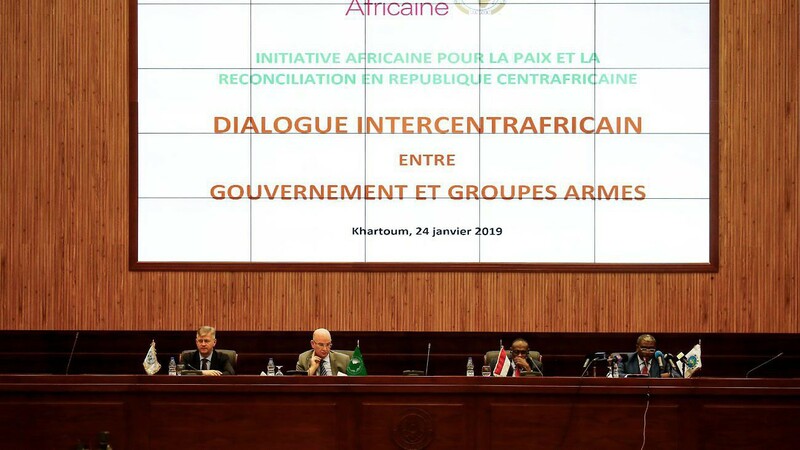 Brokered by the African Union (AU), the dialogue brings together government representatives and fourteen armed groups. Difficult negotiations lie ahead, partly because several transitional justice initiatives have already gotten off the ground in recent months. An examination of these initiatives raises a variety of questions about CAR’s peace process. Since 2012, when the last rebellion in CAR began, thousands have died and millions have been forced to flee their homes. Despite a string of ceasefires over the last six years, the humanitarian situation remains dire. One of the notable aspects of CAR’s peace process has been the centrality of justice. Even the brief administration of President Michel Djotodia, himself implicated in various crimes, promised to investigate allegations of serious human rights abuses. After Djotodia resigned in January 2014, the government of President Catherine Samba-Panza reiterated that justice was a non-negotiable part of CAR’s transition. Matching words with deeds, Samba-Panza invited the International Criminal Court (ICC) to launch investigations in May 2014, and then supported a parallel plan to establish a hybrid court to carry out prosecutions at the national level. In May 2015, the Bangui National Forum, a reconciliation conference involving CAR’s many armed groups, formally recognized that justice would be a pillar of the peace process. However, translating ideas into action has not been easy. Initially, organizing credible elections and a constitutional referendum in 2015 took precedence over the longer-term goal of restoring law and order. CAR authorities have also struggled to square demands for criminal accountability with the reality of ongoing conflict. Security has deteriorated in the last three years, stretching the capacities of the UN Stabilization Mission in the Central African Republic (MINUSCA). Under its robust mandate, the mission provides vital support to state-building and transitional justice initiatives in the country, including the Special Criminal Court (SCC). Mandated to try serious crimes, the SCC was widely expected to ensure that the worst human rights abuses—dating as far back to 2003—would not go unpunished. Though established by domestic legislation, the SCC draws on the expertise of both domestic and foreign prosecutors and judges. Similar to other hybrid tribunals in Sierra Leone, Bosnia and Herzegovina, and Cambodia, the SCC’s overriding goal is to strengthen the capacity of its domestic counterparts and thereby obviate the need for international assistance in the long run. Despite these noble ambitions, the tribunal has run into myriad obstacles since 2015. Delays have prompted concerns about the government’s commitment to criminal accountability. Most notably, some armed groups subject to investigation by the SCC are closely aligned with the current administration. Funding has also been a problem. The SCC’s budget depends on voluntary contributions, yet foreign donors have not always seen the need for a hybrid court investigating at the same time as the ICC. The recent arrest of two Central African warlords, and their future trials at the ICC, will raise legal and political questions as to why Central African nationals are being prosecuted in The Hague when there is a fully functioning hybrid court in CAR. Lastly, there have been serious challenges in recruiting qualified international and national experts. Investigations only began in October 2018, more than three years after the law establishing the SCC was initially adopted. As MINUSCA and Central African government authorities work to operationalize the SCC, other actors involved in the peace process have tried to revive the issue of amnesty. The AU has on several occasions floated the possibility of amnesty as a bargaining chip in negotiations with armed groups. To date, these proposals have been met with skepticism from other international actors, in particular the United Nations and European governments, and outright hostility from local civil society. The law establishing the SCC does not expressly prohibit amnesties, but when read together with domestic criminal legislation and political declarations, there is a strong sense that amnesty is not possible in CAR, at least for international crimes like genocide, crimes against humanity, and war crimes. However, there are several important unanswered questions related to amnesty. First, much of the discussion has revolved around a simplistic binary: is amnesty permissible or not? There have been few attempts to differentiate between amnesties for low-, mid-, and high-level perpetrators, or to link amnesty to other transitional justice tools, for instance truth-telling or demobilization programs. Second, the SCC’s mandate is not limited to international crimes. In fact, it was legislated to investigate a broader but ill-defined category of “serious violations of international humanitarian law and international human rights law.” Irrespective of one’s views on the legality of amnesty, it is clear that the SCC will deal with violations that can, at least on paper, benefit from leniency. Lastly, SCC prosecutors will soon face the very practical reality that the tribunal lacks the capacity to prosecute all perpetrators that fall under its jurisdiction. The SCC’s recent prosecutorial strategy acknowledges as much, but only goes so far in addressing the underlying selectivity problem: who will benefit from leniency in CAR? Although the Central African government seems loath to frame this as a matter of amnesty, no one knows how sixty years of impunity will be eradicated in a country which has never had a functioning justice system. These questions are likely to generate tension once the SCC launches prosecutions and the limitations of an absolute anti-impunity policy become apparent. The establishment of a truth commission was recommended by the 2015 Bangui National Forum. However, truth-seeking has received far less attention from domestic and international actors (with some exceptions). Powerful states, in particular France and the United States, have focused their support on the SCC. By the same token, some Central African constituencies view truth and reconciliation as an alternative to criminal accountability, where the pursuit of truth serves as a bargaining chip—similar to amnesty—rather than a standalone justice priority. As with the SCC, MINUSCA is expected to provide support to the proposed Truth, Justice, and Reconciliation Commission. Outreach and consultations with local stakeholders are underway, but progress has been slow. Neither the Central African government nor the international community has developed a holistic transitional justice strategy for CAR, which inevitably raises questions about the truth commission’s relationship to other justice mechanisms, in particular the SCC. CAR’s peace process offers lessons for the evolving field of transitional justice. First, it underscores how difficult it is to pursue criminal justice in the absence of peace. To be sure, violence is not the only reason the SCC has struggled to get off the ground, but the government’s inability to control vast swaths of its own territory raises almost insurmountable operational challenges for the SCC in 2019. Second, CAR illustrates the importance of the anti-impunity norm. Although amnesty has been proposed time and again, CAR’s government and the UN have taken a rigid stance, ruling out any discussion of amnesty even for low-level perpetrators. Whether this principled position can be reconciled with the challenges of negotiating a permanent peace remains to be seen. Lastly, CAR reinforces that choices must always be made about the types of justice to prioritize. Peace agreements have provided for the establishment of a truth commission, and there is even talk of reviving traditional dispute mechanisms in CAR. But in a world of limited resources, transitional justice projects compete with one another for attention. Thus far, Central Africans and international actors have prioritized international criminal justice. It is an open question whether this policy will indeed break the “cycle of impunity” and bring lasting peace to CAR. Patryk I. Labuda is a Hauser Global Fellow at New York University School of Law. An earlier version of this article appeared in the Proceedings of the 2017 Nuremberg Forum of the International Nuremberg Principles Academy.